The Tektronix AFG3101 is available to buy refurbished used or rent, usually from our UK stock. Click here to download the Tektronix AFG3101 datasheet. The TEKTRONIX AFG3101 is a member of the AFG3000 series function generators. Unmatched performance, versatility, intuitive operation and affordability make the AFG3000 Series of Function, Arbitrary Waveform, and Pulse Generators the most useful instruments in the industry. Users can choose from 12 different standard waveforms. Arbitrary waveforms can be generated up to 128 K in length at high sampling rates. On pulse waveforms, leading and trailing edge time can be set independently. External signals can be connected and added to the output signal. Dual-channel models can generate two identical or completely different signals. All instruments feature a highly stable time base with only 1 ppm drift per year. A large screen shows all relevant waveform parameters and graphical wave shape at a single glance. This gives full confidence in the signal settings and lets you focus on the task at hand. Shortcut keys provide direct access to frequently used functions and parameters. Others can be selected conveniently through clearly structured menus. This reduces the time needed for learning and relearning how to use the instrument. 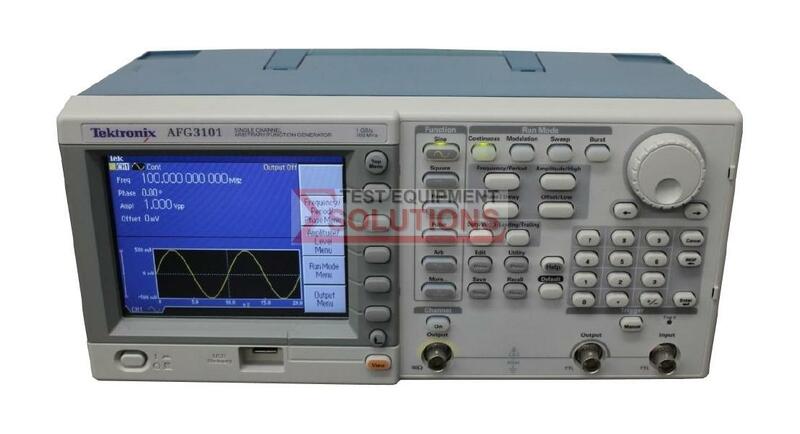 We offer the refurbished used Tektronix AFG3101 100MHz Arbitrary Waveform Generator for sale and rental. The Tektronix AFG3101 is fully tested and refurbished in our in-house ISO9001 calibration laboratory. We supply manuals, accessories, full warranty and a free-of-charge Certificate of Conformity. We can also provide the Tektronix AFG3101 with a fresh calibration for a small additional charge. If you have under-utilised test equipment talk to us about trading-in or part-exchanging it towards the Tektronix AFG3101 or other refurbished test equipment.